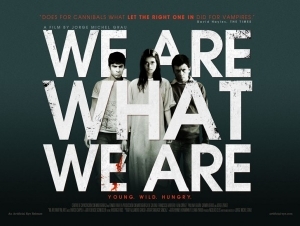 Jim Mickle's WE ARE WHAT WE ARE Remake Gets Sequel, Prequel & New Clip! If you were on the ball earlier this week you may have caught a peek at the first footage from Jim Mickle's We Are What We Are remake before it was removed from the official Cannes Vimeo account. The clip suggested that Mickle's remake was going to be a quietly gruesome affair and while we wait to hear how the movie is received at Cannes, it seems producers Memento Films International have no doubts it will be successful; they announced that they had launched sales on both a prequel and a sequel to Mickle's movie. AJ Annila, the director of Sauna and Jade Warrior, has been tapped to direct the prequel, his first English language film, titled What We Were which will tell the love story of Frank and Emma Parker and how Frank first introduced Emma to cannibalism. Jorge Michel Grau, the Mexican director responsible for the first film on which Mickle's remake is based, has been tapped to direct the sequel. He's currently in the process of developing the story and the film is scheduled to shoot next year. In addition to all of these news, there's also a new clip from the remake floating around online. This one is even less about the cannibalism and focuses on the two sisters as they share an intimate moment.